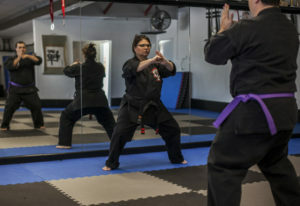 If you are an adult who is looking for a way to lose weight, strengthen your body and otherwise get healthy, you might want to consider signing up for martial arts classes. Not only do martial arts help you gain more confidence, learn self-discipline and become better prepared for self-defense, but it offers a wide variety of health benefits as well. Here is a look at just a few of the health benefits adults who take martial arts classes enjoy. Confidence: When you’re confident you can defend yourself, and don’t come across as easy target that most bullies look for. Also, if you have accomplished something a little difficult then you have confidence that you can move onto a new level, not just in martial arts but in any area of your life. Fostering Self-Discipline: One of the central tenets of all forms of the martial arts is an absolute focus on self-discipline. Today’s kids are so accustomed to receiving instant gratification that lessons in self-restraint and discipline aren’t always easy to come by. Kids with a martial arts background, however, are continually reminded of how essential self-discipline is. Martial arts give children practice using the body and mind in harmony. Boosting Socialization Skills : Kids who don’t always thrive in highly social environments may find it easier to get to know people and make new friends when they’re in a room filled with peers who share a common interest. The kids on the playground may not always have much common ground, but devotees to the martial arts are able to get to know one another through shared pursuits. Encouraging Non-Violent Conflict Resolution : Thinking that martial arts instruction promotes violent behavior is justified if your only experience with the activity comes from television or movies. In fact, many defensive styles teach kids peaceful, non-violent conflict resolution skills and emphasize the importance of avoiding a physical altercation. Using your training to defend yourself is the last alternative when there are no others. Improving Listening Skills : In order to master the skills she’s being taught and advance through the belt ranks, your child will have to exercise superior listening skills. Kids who aren’t always adept when it comes to paying attention to what they’re told can benefit from the verbal instruction and one-on-one work in her dojo. Self Defense: So, here comes the most important and crucial part of learning martial arts as well for life. Have you given a thought about why do people fail to protect themselves only at times. That’s because they are not able to self-defend themselves. So buck up your shoes and go for martial arts class because it most importantly teaches you self-defense which will not only help to protect yourself but save other people’s life as well. For girls specially it’s the best way to indulge yourself in any of the martial arts training sessions as it will make you fight against the men who try to tease or harm you. Children are specially taught how to avoid confrontations after they recognize a potentially dangerous situation. Martial arts along with actual self defense teaches you strategic self defense. Leadership: Part of becoming a black belt and higher is teaching beginning students. We have a great Junior leader programs that puts your child into teaching role where they learn the responsibility of teaching the newer students. In this program, they learn how respect is earned through commanding properly, not by demanding improperly. How learning to give back in the best route to being able to receive. Encouraging Physical Activity: Limiting screen time is a great idea when it comes to getting kids off the couch and encouraging them to be more active, but it only goes so far. Enrolling an inactive child in such a physically demanding pastime not only discourages the sedentary lifestyle she’s used to, but also gives her an enjoyable activity that inspires her to keep moving. We have an epidemic of childhood obesity in this country. Martial Arts is a great way to get moving and burn off calories. Every child needs to be active for 60 minutes a day. 10 minutes of playground recess just isn’t enough exercise to keep our children healthy and thriving. Physical activity also stimulates brain activity. 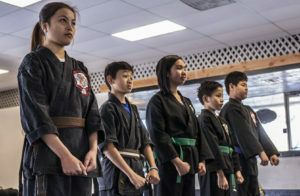 Learning to Set and Achieve Goals: Most forms of martial arts are based around an accomplishment system of colored belts that signify the wearer’s degree of skill. When your child strives toward each new belt, he’s learning valuable lessons about setting and reaching his goals. Improvement in Other Areas of Life : The benefits of martial arts training don’t end in the dojo. The boost in confidence, increased fitness level and new cooperation skills will also help your child navigate the academic and social aspects of school, affect his behavior at home and have an all-around good influence on him as he develops into an adult. The time is now for you to invest in your child’s future. Pick up the phone, call and set up a FREE trial lesson today. Your child the best opportunity’s in life there are. Enrolling TODAY is the best way to improve their opportunity of being successful in tomorrow’s world. Build Strength: No matter what type of martial arts training you pursue, you are certain to increase your muscle strength while also improving your musculoskeletal health. This increased strength will help prevent injury from normal day-to-day activities while also reducing your risk of experiencing aches and pains as you grow older. Increase Endurance: Martial arts will also help you increase your endurance in a number of ways. Not only will the regular training sessions increase your aerobic cardiovascular endurance, but your muscles will build more endurance as well. As a result, you will be able to engage in physical activities for longer periods of time without becoming winded or developing sore muscles. Improve Flexibility, Speed and Balance: As you master the moves you are learning in your martial arts class, you will experience increased flexibility, speed and balance. All of these things together will help to improve your functional strength while also helping your body become better prepared physically-demanding tasks. Reduce Risks of Obesity: Martial arts burns a significant number of calories while also increasing the metabolic rate and making the body stronger. As a result, you are likely to lose weight after you start taking martial arts classes. Or, if you are already at your ideal body weight, you will be better able to maintain your weight. By reducing your risk of obesity, you also reduce your chances of developing obesity-related conditions such as diabetes and high blood pressure. Exercise the Heart: The exercises and routines you perform in your martial arts class will force your heart to get to work. As you reaching your target heart level and continue to engage in physical activity, your heart will grow stronger and better capable of working for longer periods of time. As your heart grows stronger and healthier, your risk of developing heart disease decreases. The time is now for you to invest in your future. Pick up the phone, call and set up a FREE trial lesson today. Begin your journey into a life changing path. Enrolling TODAY is the best way to improve your opportunity of being successful in tomorrow’s world.